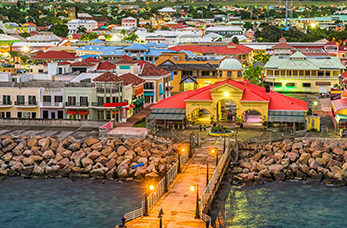 Basseterre is the capital of St. Kitts and Nevis set before the dramatic backdrop of St. Kitts lush green hills, located in the southern part of the island. The island is home to fascinating historic sites and cultural treasures. Today Basseterre has some of the best restored and preserved Georgian character of Nelson's days. Boasting attractive panoramic views overlooking St. Kitts and Nevis this once military fortress is one of the best preserved in the Americas. The oldest sugar plantation on St. Kitts with its botanical gardens, set in a majestic location no visit to St. Kitts would be complete without a tour of the Historic Romney Manor. Visit some of the grand homes which have been left behind by wealthy landowners that have been restored and filled with antiques. This scenic railway runs around the major part of the island showcasing the loading sites which harvested sugar cane along the route.